Altman’s Portrait of I.P. Degas, Tretyakov State Gallery. Photo by Andy Freeberg. 2nd Century Mummy Masks, National Pushkin Museum. Photo by Andy Freeberg. These guardians of culture take their jobs seriously. One guardian said that this responsibility is worth the three-hour commute to and from the Tretyakov Galleries museum, where she’s worked for more than 10 years. She told Freeberg she’d rather be sitting among the history of her country than sitting on a bench by her house complaining about her illnesses like other old people do. 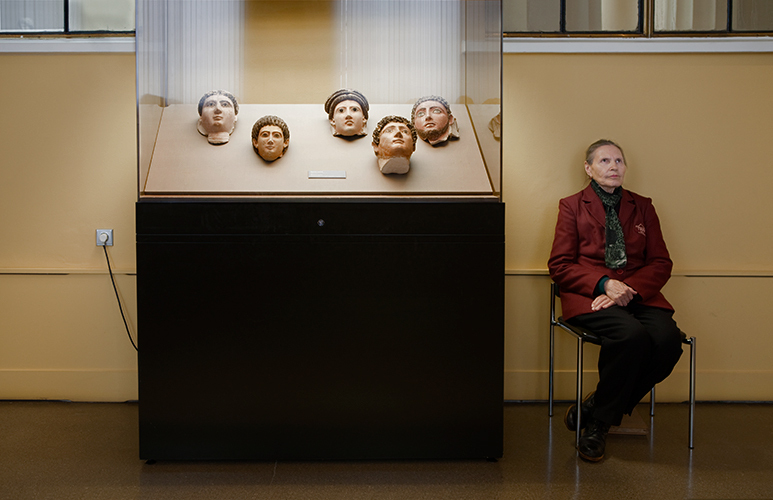 Patrons of the museums, however, are so used to the guardians’ presence that they often look past them or don’t notice them at all. What do you think? Are you ready for extremely slow art? If you had to pick one artwork to look at for day, weeks, months and years on end, which would it be? You can start to have this experience by viewing some of the guardians on Andy Freeberg’s website or see all 37 images from the project in the Guardians book, on sale now. -written by Jennafer Martin, Slow Art Day blog editor; edited by Phil Terry. If I had to pick one artwork to sit and look at for hours, days, months and years, what would it be? What would be so important that I might volunteer to guard it like these Russian women? The first that comes to mind is the artwork that started Slow Art Day – Hans Hoffman’s Fantasia. The experience of looking at that painting hanging in the Jewish Museum in 2008 taught me so much that I decided to launch this global movement. What did I learn? It taught me a lot about color and composition. It taught me about influence and impact – and it taught how to be more open to a multi-dimensional experience: emotional, intellectual, and visual. I also love David Hockney’s work, including his cubist photo collages. I might choose Pearblosson Highway to look at for a long time. He took thousands of pictures over a 10 day period and then put them together in an interesting and provocative way. Every time I look at Pearblosson I see something new. You can read about the experience of really looking at this Hockney here in this blog post. There are so many paintings and sculptures and installations that I love that it would be difficult to pick one to guard for a lifetime. But, these two would certainly be among the many I’d want to look at and protect with my vision and presence. These women are so stern, formidable, forbidding. Their artworks must be well protected! But I’d be uncomfortable standing for any length of time in front of one of their treasures. Going through the website I found it interesting that only one of the guardians was looking at the art. What is the photographer telling us? Interesting too, that in the captions, the artworks (and the museums) have names; the women don’t. While I couldn’t imagine sitting in front of a single artwork for years, I find these women inspirational. Guarding (literally) their culture and protecting it from harm. What a powerful idea. Reading this made me think less about a single work of art and more about my responsibility, and our collective responsibility, to protect our culture and to go one step further: help it flourish. That’s why I love Slow Art Day. It isn’t about a single work of art for me, it is about the reminder, even if for just one day a year, that what makes us who we are is so much richer than a sound bite. I am very struck by Caroline’s comments. I also find it strange that the captions do not include the names of the women. Isn’t the artist making the point that these women, who guard Russia’s greatest treasures, are themselves treasures? To dedicate your life to protecting your country’s history is quite an honor and it serves as a beautiful notion that these women feel that way. I do believe that these “guardians” have become part of the work they sit in front of. Although, I’m not sure I would feel that way in person; it would be very difficult to practice my Slow Art skills with someone sitting right in front of me. 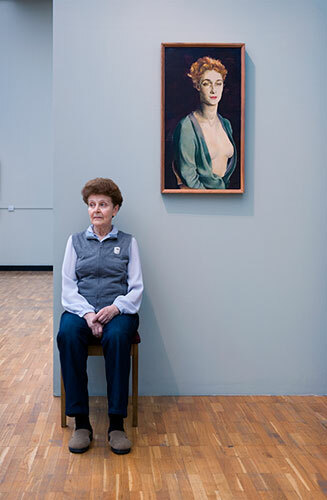 But the photographs by Andy Freeberg offer a wonderful insight into the lives and culture of Russian museums. As for the one painting I would choose to look at for years, it would have to be “Les Nymphéas” by Monet. Housed in the Musée de l’Orangerie, I spent many days, while in Paris, revisiting this work. There was something so striking about it. Perhaps it was its large scale or the installation of it (in 2 bright white, circular rooms displaying 360 degrees of the water scenes). Every time I returned I would notice something different- technique or coloring, imperfections and even pieces of blank canvas. There would be sections of the work, side by side, that had been executed completely different from one another. I imagine it was because of the years it took to complete the work. I think I could live with that work for a lifetime. I grew up in St. Petersburg and when I went to the Hermitage when I was little, I always paid attention to these women. I remember wondering what they must be thinking about, and how well they would come to know each artwork if they sat together with it for so long. Thank you for this posting about my Guardians project. To answer Caroline and Dana’s question: I wanted to include the women’s names in the captions for the Guardians book. I was told not to do that by my contacts at the Russian museums. They told me it was a privacy issue. These women are the stars of this project. Most of them have received a print of themselves and when I return to Russia for an exhibition that’s in the works, I will present each of them with a book. There is something very emotional and inspiring about the way these women are guarding the artwork before them, but moreso, their cultural heritage. What will happen when these women who know and understand the significance of these pieces will not be there to keep that light alive? I don’t know that I can pick one piece of artwork that I’d choose to see for the rest of my life, but there would have to be an extraordinary connection and meaning to my life and culture. I wonder if these women got to choose their artwork? We all hope to find meaning in the work that we do, and to think this job extends to such a big-picture responsibility is empowering. I hope I one day have the opportunity to see this in person, as seeing the connection of the art to it’s “keeper” would be very enriching. To experience the art yourself, but also through someone else who values it on a completely different level. The thought of keeping a nation’s history and culture alive through artwork is a very beautiful idea. I have a difficult time envisioning this occurring at The Met in NYC, but maybe that’s just a difference of culture?! Beautiful photographs. What a wonderful way to honor these guardians of culture. Bosch’s “Garden of Earthly Delights” would be my choice.